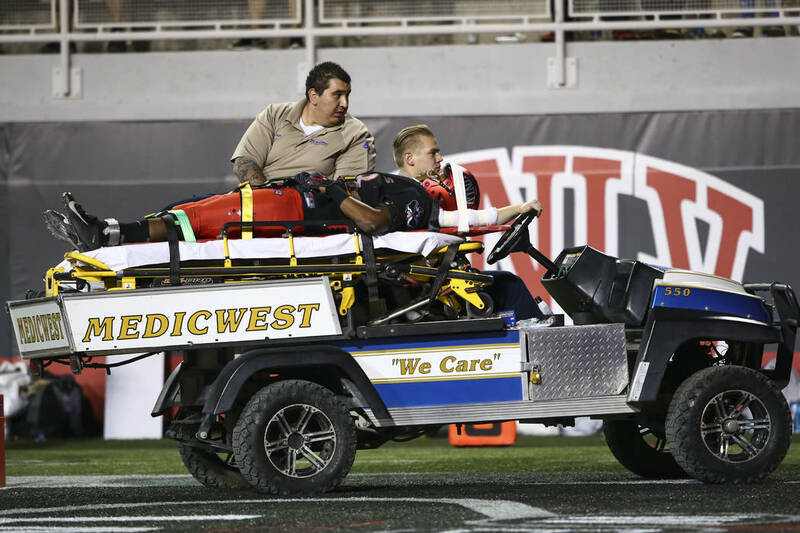 UNLV junior defensive back Ty’Jason Roberts suffered a spinal fracture in Saturday’s 46-17 victory over Prairie View AM. He underwent what was termed successful surgery. Roberts underwent what was termed successful surgery Sunday morning at University Medical Center’s Trauma Center. Coach Tony Sanchez is expected to update Roberts’ condition at his weekly news conference Monday. The Rebels (2-1) next play at Arkansas State (2-1) at 4 p.m. Saturday. ESPN3 will stream the game online. UNLV opened as a 6½-point underdog offshore. A Las Vegas betting line hasn’t been posted. Roberts (6 feet, 195 pounds) received his first career start against Prairie View, lining up at nickel back with junior Jericho Flowers and senior Jocquez Kalili at the cornerback spots and junior Evan Austrie and senior Dalton Baker at both safeties. Roberts had one tackle before getting injured in the second quarter. His mother, Ramona Finley, went down to the field and stood next to Sanchez as Roberts was immobilized and then carted off.